When the Caribbean destination of Saint Lucia agreed to host ABC’s The Bachelor for a second season, they asked us to help harness the power of all that love in measurable, impactful ways. If you’ve ever hosted or been the backdrop for a show like this, you know what they meant: you make a huge investment to get the show to your destination…how do you then inspire those viewers to engage with you more closely and ultimately book a trip? So Redpoint coordinated a massive integrated marketing program that brought together the Tourist Board, island tourism operators, hotels, attractions, tour companies, and more. We helped rally all these stakeholders around Bachelor-themed romance concepts, and if you’re not familiar with the show, red roses play a huge role in the storyline…and so red roses became a key element of the marketing program. The island felt the love from all these enhanced marketing efforts surrounding their collaboration with The Bachelor. 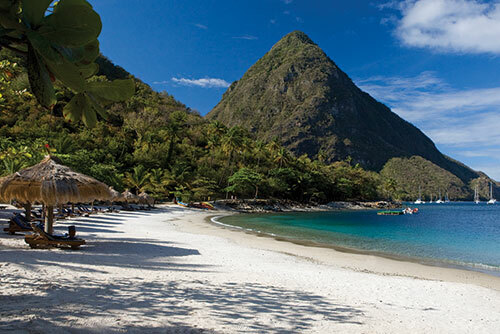 The Saint Lucia Pinterest page tripled in size, the interactive Facebook map doubled the amount of traffic funneling through to the operator websites, and the Saint Lucia Facebook site increased its fan base by 35%. Total media reach for the campaign in the first month alone exceeded 100 million. We’re pretty sure that the tourist board executives kissed the results report when it was delivered.